When we first met Kurt on Glee, he was already in high school… and in a parking lot, surrounded by a group of menacing jocks about to toss him in a dumpster. His one request? That they allow him to remove his Marc Jacobs jacket before they toss him in. From the get-go, Kurt was established as a non-hetero-normative character, and even if he hadn’t come out yet, people at McKinley (as well as network audiences) must have had some inkling he was gay (or otherwise not straight). Justin, on the other hand, wasn’t all grown up, let alone sexually threatening to mainstream viewers, when he was introduced on Ugly Betty. We first saw him as a little kid who sang Hairspray tunes on the subway, and provided adorable, funny lines as a foil for Betty and her family. Back then especially, the focus of his character wasn’t on his sexual orientation — rather, it was how cute he was telling Hilda, “Don’t phunk with my heart,” and obsessing over fashion. Viewers saw Justin skip out on summer camp to sneak into the Mode offices in season 2, try out a “macho” image after his dad died, drinking, wearing a leather jacket and making out with girls. Later in season 3, he started an unlikely friendship with bully Randy and had it fall apart as quickly as it started thanks to everyone’s best friend, peer pressure. Finally, in season 4 he started high school and lived through the homecoming rally incident. Through Ugly Betty’s four seasons, viewers related to Justin, regardless of their sexual orientation, because his journey through adolescence was depicted from start to finish without any awkward, melodramatic storylines shoehorned in to boost ratings. It was a natural progression from a kid who was called a “fairy” for singing “Good Morning Baltimore” in public to someone who finally accepted himself for who he was. His character led people to view him as a beloved person with feelings before he faced an accurate portrayal gay-bashing on network TV. Glee fans owe it to Ugly Betty for humanizing homosexuals on television, as Justin may have opened the minds of executives and writers on who was “allowed” to be on primetime without scaring audiences away. Justin has had his fair share of teasing over his show’s four seasons: He lost his “friend” Randy because he was teased at school for his effeminacy, and the homecoming rally was anything but kind feelings towards him. However, Ugly Betty’s writers never let us see any melodramatic scenes where Justin broke down and lost his will to fight, as we so often see on Glee with Kurt. Instead, we see Justin stand up for himself time and time again. After the homecoming rally scene, Justin was visibly hurt, brushing off his mother and telling her, “It’s a joke, I’m just playing along. I’m not gay.” Justin took his mentor Marc’s advice instead, and turned the joke around on his classmates (those suckers). Even Justin’s coming-out scene was a quiet affair. Rather than show us the Suarez family crying around the dining room table, amidst flashy decorations for the coming-out party they attempted to throw him (which would just be plain weird and not fit the show’s too-bubbly tone) Justin came out in his own way: He asked the boy he had his first kiss with, Austin, to dance at Hilda’s wedding. Don’t get me wrong — coming out is a painful struggle and tears are inevitable. We already know how Justin feels, though, because we saw him cope with it for the past few years. Showing another scene where he is crying would have an adverse affect — it would make him out to be too weak and squeamish in the context of Ugly Betty and the then-climate of network TV. Seeing him be confident, accepting himself for who he is and not caring what the other wedding guests thought about their dance made him a strong role model for viewers and future gay and lesbian television characters. Maybe it says something about Glee that Kurt’s pain is so instilled in the show in order to demonstrate that being a teenager means that you’re a walking open wound sometimes — though while both realities are allowed to exist, the parallels of his life experiences to Justin’s are plain to see. Ugly Betty was in no way a masterpiece (even “good” and “decent” are strong words), but it prepped modern audiences for more vulnerable teenagers like Kurt in years to come. Unlike many families — both on and off-screen — the Suarez family had always been accepting of Justin, even before he came out. In the first season, Hilda tells Justin’s father, Santos, “He’s comfortable with who he is and so am I.” Betty kept encouraging him to admit he liked Austin, not Lily — the girl he insisted he liked to anyone who would listen — and the family tried to throw him that aforementioned “coming out party.” Over the course of those four seasons, however, Justin also formed an unlikely bond with someone outside his family: Betty’s gay co-worker, Marc (mentioned above). 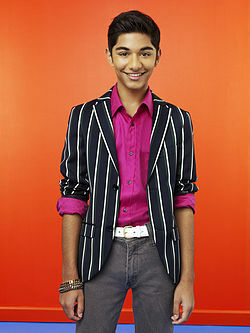 Marc held a crucial role that no one else on Ugly Betty could for Justin. Although Marc wasn’t exactly a big fan of the Suarez family (remember that time he dressed up as Betty, complete with fake eyebrows? ), he was always there to support Justin and act as a mentor. Marc was someone separate from Justin’s family life who also went through being a gay teen in a intolerant public high school. Even before Justin came out, Marc was always open to talking to Justin about his feelings for girls, and all of the standard problems young people have to deal with. Marc didn’t want Justin going through the same hardships he went through, like having his family reject him (which we got to see in season 1’s “Don’t Ask, Don’t Tell” when he came out to his mother after defending Justin for being “swishy”). Marc even gave Justin the advice to tease his bullies back, making the joke on them. The dynamic between Justin and Marc was important for both Justin’s self-discovery and for the role of LGBTQ teenagers on television. Very much like Ugly Betty’s heartwarming, but super-cheesy theme, Marc helped Justin learn that it’s okay to be different and interested in fashion magazines and Beyoncé rather than sports. It’s okay to be yourself — and you should be proud to be different. It’s a theme that Justin confidently upheld, that Kurt Hummel proudly displays on Glee (evidenced by his dance to “Single Ladies,” obsession with Broadway, and fashion-conscious, albeit usually strange, style choices) and one we’re about to see Santana try to embrace. Most importantly, acceptance and pride are notions that are now thankfully welcome on mainstream TV, even if Glee can be absolutely unwatchable sometimes. This was published at Television Without Pity on November 22, 2011.